Cozy up for the weekend, ‘cuz there’s another storm rolling in on the tail of our latest one, which dumped inches of rain on the North Coast and caused power outages (directly) and AT&T outages (indirectly) over the last couple days. Eureka is also in its 12th consecutive day of rainfall, the longest streak since 2009. Between 6 a.m. Wednesday and 6 a.m. this morning, Woodley Island recorded 1.88 inches of rain. 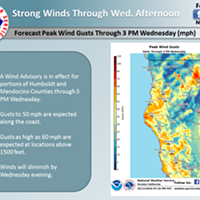 Much of the Humboldt County coastal areas saw the same, but inland saw loads of precipitation: 5.12 inches in Miranda, 4.12 inches in Hoopa, 2.16 inches in Orick. 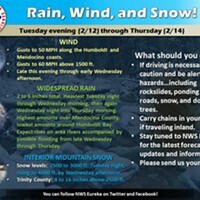 Eureka Meteorologist Shawn Palmquist said another storm system is moving in overnight and will continue through Monday. 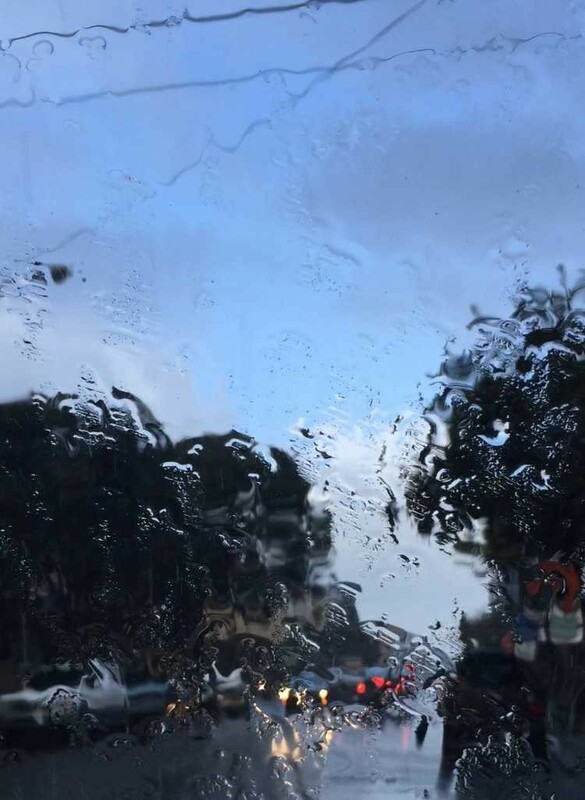 The Weather Service is expecting warm rain from the northwest to hit the Eureka area by mid-day Saturday and develop into significant rainfall: 1 to 2.5 inches on the coast and 4 to 6 inches in the mountains. 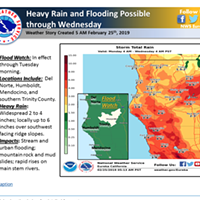 Higher rainfall is expected in Del Norte County. “It’s definitely working with a lot of moisture,” Palmquist said. There's a surf advisory in effect through tonight and a high wind watch Saturday night through Sunday afternoon. Eureka is slightly ahead of the average rainfall for its water year (which begins Oct. 1). The city has recorded 10.80 inches of rain through Dec. 11. Last year during the same period we had 13.07 inches of rain. We’re well over the average rainfall for the beginning of December. Since Dec. 1, Eureka’s seen 4.74 inches. The average through Dec. 11 is 2.84 inches, and last year saw 4.44 inches. Eureka was slightly under average last month, recording 4.88 inches compared to an average monthly 5.61 inches.